I graduated at the young age of 19, and had my first work at 20. It was a part-time job as a clinical instructor in a state university, the same institution where I graduated. After a year of being a job order, I was promoted to a contractual position. After three years as a contractual, I was given a temporary status going to permanency. But, before I reached the two-year probationary period, I was reverted to a contractual status. All my dreams were shattered during those times. I had already planned to settle and have my own family at the age of 28. Due to this unfortunate circumstance, plans had to change. My contract ended and I was not renewed. 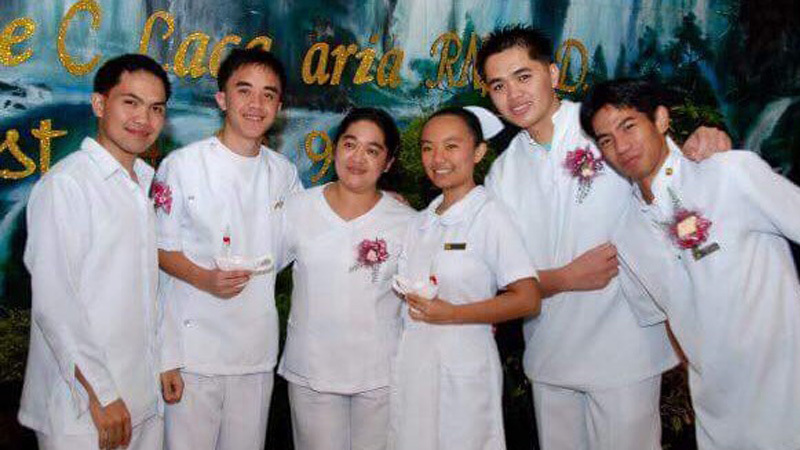 I had no permanent job for more than a year until I was hired again as a job order nurse in a healthcare facility. And I needed to start all over again after the six years that I invested in an institution. A friend of mine shares the same story as mine. However, after more than a year of trying our luck to work overseas, he got a job offer in the Middle East as a clinical instructor. The sad part is, the situation led to the destruction of his family. Annulment has been filed, and while the case is in progress, the children suffer. As I stand here, I hear fellow Filipinos asking that their rights be given to them. It is surreal to be in the middle of the action, seeing Filipino workers here today who in the workplace are overworked and underpaid, to the point that they can’t afford their daily needs. This Labor Day march is joined by many young people like me, who accompany them as they ask for decent jobs. I am here with my parish priest Rev. Mary Grace Ejercito Masegman and husband Deacon Ritchie Masegman. They came with me and the other young people from Church. From where I am, I see other churchmates from Iglesia Filipina Independiente, people from the National Council of Churches in the Philippines and the Promotion of Church People’s Response, Kilusang Mayo Uno, farmers, unionists and more. All in all, we are 50,000. 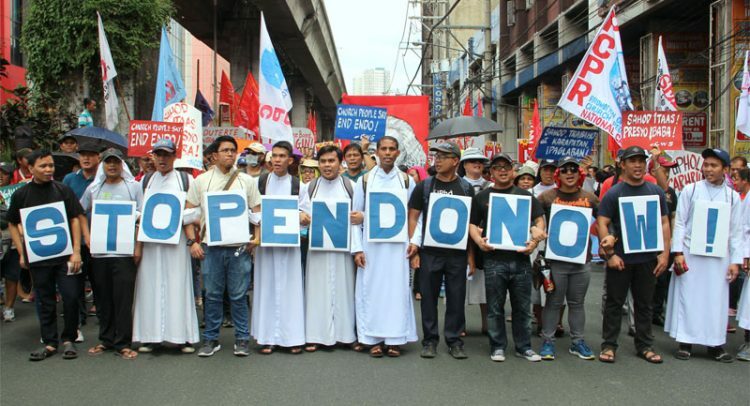 I join these mobilizations to hear the plea, the hardship, the struggle of my fellow Filipinos, especially laborers. I need to hear and learn, to understand. If I weren’t here, I’d be at church, organizing activities, but I find this worthwhile. I chose to be here because the Church should be here, and not only here to watch but to fight with the people until their human rights are given to them. As I look at our backyard, I am reminded of the greatness of God, and how blessed we are to have such a beautiful lake. I always remember that when Jesus did his ministry, his first disciples where fishermen Simon and Andrew. They immediately followed Jesus, for they knew He was a different person, a different teacher. Let me share what I heard working with the fisher folk of Laguna de Bay. My grandfather was a fisherman, a great believer that everyone who lives by the lake must take care of it. I know he would have wanted to share a lot of stories but I was not able to engage him in deep chats when he was still alive. Aside from tales within the family, I learn more about him through those like him — like Tatay Oca. He told me that in the morning, fisher folk would sail into the middle of the lake to catch fish. They would return before noontime. They would carry their flashlights and nets, uncertain every time if they would catch enough for the needs of their families. He said it was now very hard for them to catch fish. You’d have to check if the water permits a good catch, but prepare the nets anyway, ensuring it doesn’t have a tear. Jesus’s first disciples were young fishermen, and it must have come with advantages. A diligent work it is to be a fisherman, learning the mood of the lake, preparing equipment, working for enough catch to sustain the family. They share to others when they are blessed abundantly; are resilient in times of calamity; work together for the common good, especially on matters concerning the lake. They know the simple life; the common people. Almighty and eternal God, You have revealed Your glory to all nations. You are God of power and might, wisdom and justice. Through You, authority is rightly administered and laws justly enacted. We repent for the unjust inequality and hardship reigning in the world today. We ask Your unbounded power to be in our midst. Be among those who toil as they work, so they may be safe, productive and not desensitized to the common good. 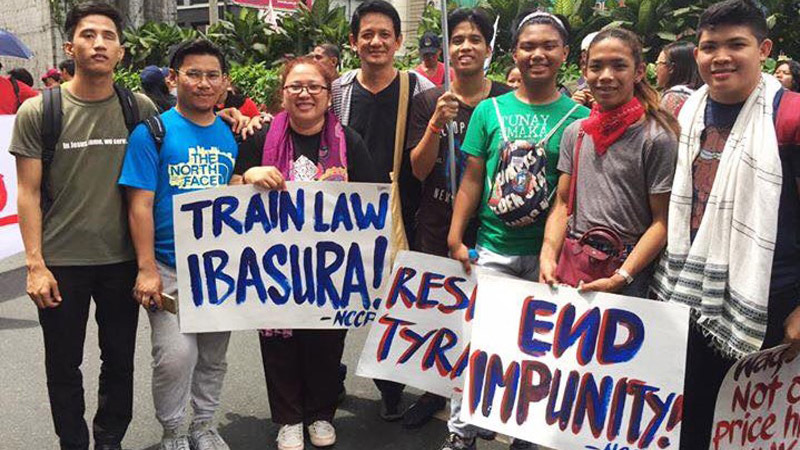 May those who struggle for justice and equality in the labor sector be guided in their noble cause, not missing hope, working diligently and discerningly. May we achieve a world where children enjoy life instead of work; where workplaces uphold respect and dignity; where there is proper return for labor; where workers are mindful and concerned of the rightful aspirations of others. Guide and sanctify us for the mission of abundant life for all. Through Christ our Lord. Amen. All the writers are members of organizations affiliated with Kalipunan ng Kristiyanong Kabataan sa Pilipinas. KKKP is the expression of the ecumenical movement among Christian youth in the country, of which PLYL, YIFI and CYF are members. This is some of many reflections from young Christian voices, which will also be posted at the NCCP website (nccphilippines.org).